This year, I really dedicated my talents towards designing more knitting patterns. It has been a worthwhile challenge since it resulted in my Bake Knit Sew book, but also because it made me appreciate the strengths and limitations of certain wools and tools in the process. One yarn I always gravitate towards is super bulky/chunky because the colours are usually vibrant and it seems like an easy knit because it would go quickly. But it also has limitations. It is difficult to find a decent Fair Isle pattern in this yarn weight because the weight does not lend itself to the structure of stranded colorwork. The bulk makes the resulting item stiff, unforgiving, and a bit like chainmail armour. But sometimes with a smaller project and the right gauge, it works. And so began my Jeune Coeur Cowl pattern. Knit with super bulky/chunky yarn, this cowl uses a small amount to create a colorwork design of hearts. It is uniquely sized for a child too. One thing I love about children in cowls is that you don’t worry on escalators or bicycles that the trailing end of the scarf will get caught. 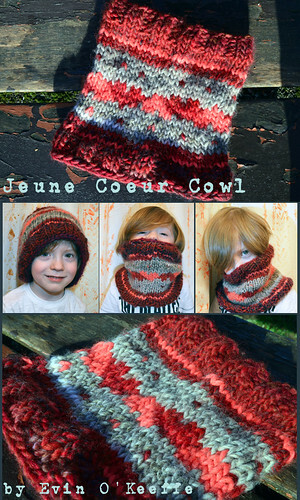 The Jeune Coeur Cowl has a related pattern for adults too! It is called the Coup de Coeur Cowl. This entry was posted in Knit Scarves & Cowls, My Knit Patterns, Tutorials | Patterns and tagged cowl, knitting pattern, my designs.